Thayne-san, today we’re going east of Asakusa Station. We’ll visit a long-established tsukudani shop, the Ebiya Sohonpo, on the corner of the intersection just across the Azumabashi Bridge. The view from Azumabashi Bridge is great. We have a great view of the Sumida River, and if we look up we can see the Tokyo Skytree. There’s also the Asahi Beer Headquarters with the very unusual object on top. That’s right. Both sides of the Sumida River will be even more beautiful when they’re decorated with cherry blossoms in the spring. 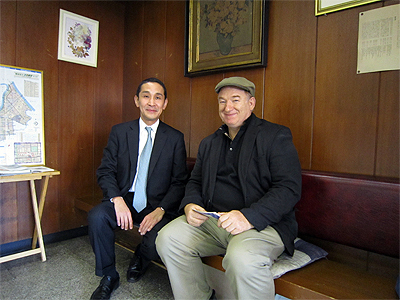 Kawakita-san: Hello Thayne-san and Concierge-san. My name is Kawakita, the head of the company. Hello Kawakita-san. Nice to meet you today. This is a great location. Kawakita-san: Thank you. Actually, when the business was first located here in 1869 by the founder, he didn’t choose this spot just for the scenery. It was mainly because of the clear and clean water of the Sumida River. It was a good place to catch icefish, freshwater shrimp, carp and so forth. So I guess that made ingredients for making tsukudani free. Kawakita-san: Yes, that’s right. Having Sensoji Temple on the opposite bank of the river is a bonus. There are worshipers all year around, and so we were able to take our products across the river and sell them in no time. Wow, that must have been profitable! Kawakita-san: Yes, perhaps, but there were a lot of rivals, so we had to be innovative to stay in business. The second generation owner was especially innovative. He spent some time training in Kansai, and learned to take advantage of delicate flavorings such as ginger, shiso and pepper. Before that, in the Kanto area, most of the flavoring was done using just soy sauce, but the second generation owner also started to use sugar, giving the tsukudani a sweet flavor, which became a big hit. It’s now common to use sugar in tsukudani, but at that time, it was quite revolutionary, then? Kawakita-san: Yes, that’s right. Our tsukudani still has a reputation for having a light, slightly sweet flavor. So it looks like there are all kinds of tsukudani―so much variety. Does the type of tsukudani stay the same throughout the year? Kawakita-san: Some are the same throughout the year, but there are also some seasonal items served when they taste the best. I think most people think of tsukudani as being a way to make food last a long time, but you also have vegetables and fish tsukudani in season? Kawakita-san: Yes, please try some of them. The boiled shrimp is delicious. It would go great with beer! 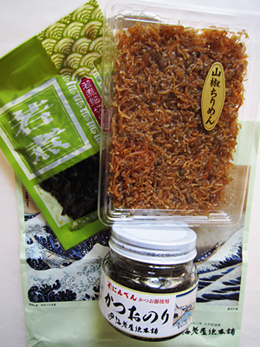 The shredded kelp tsukudani is really easy to eat! That’s true. The sansho (Japanese pepper) baby sardines have a nice light taste. With some rice, I’m sure I couldn’t stop eating it! Kawakita-san: Thank you. What you’re trying now is dried and shaved bonito and seaweed, made in collaboration with a foods company called Ninben. I thought tsukudani was all the same, but I guess that’s not true. 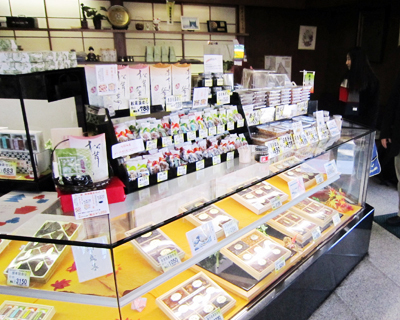 Actually, last autumn in Tokyo Station, a gift-shop corner was set up called Tokyo Mitasu. There are several Toto Norenkai shops there, and also three tsukudani shops. You can even buy whatever you want from any of the shops and put them together to make a gift pack. That’s a new idea! So you can try a lot of different flavors. Kawakita-san: To be honest, it’s kind of hard for us to do it that way, but the shoppers really like it. It really made us think about how we do business, so it was a good experiment. I kind of think of the traditional Toto Norenkai shops as being really conservative, but it seems like everyone is very willing to try new things. I see. So that’s how important lessons are handed down from one generation to the next? Did you grow up knowing that you would someday take over the family business? Kawakita-san: No, I didn’t. However, I realized I was the fifth generation, and that I would someday take the place of my father. But after college, I worked for a bank in sales for 15 years. Kawakita-san: For a while, I was in charge of the food company section, so it was a good learning experience. It felt good to have the responsibility, and I enjoyed working with my staff, so when it came time to quit, it was really difficult. I’ve now been in the family business for 12 years. Is there an aspect of your job that you especially take pride in? Kawakita-san: I think it’s meeting the needs of our clients. We have to develop new products for the changing tastes, and also change the way we sell our products. At the same time, I’ve recently been thinking more about how to promote the products from this part of the city and not just my own products. 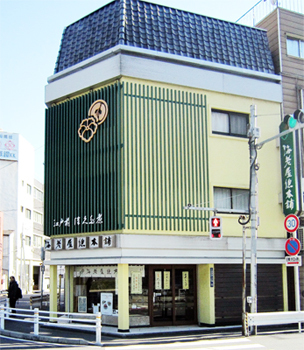 We belong to the Honjo Azumabashi Shop Association, and we try to create events and work with the community to have more opportunities to meet people. Other members of the association include Chomeiji Sakuramochi and Kototoi-dango, both Toto Norenkai members, and also Asahi Beer, and so everyone contributes in a variety of ways. Kawakita-san: Yes, so definitely please come to some of the events. Actually, I have something I’d like to ask you about. We have a shop in Tsukiji, and a lot of foreigners come by and ask us about tsukudani. But how can we explain what tsukudani is in a simple way? I think they understand that shrimp tsukudani is a type of finger food, but I’m not sure how to explain fish and shellfish tsukudani. That’s not easy because there’s nothing really like it in Western cuisine. But I think if you said something like “delicacies simmered in a sweetened soy sauce” most people will understand. But of course, a taste is worth a thousand words! Kawakita-san: Oh, I see! Thank you. I’ll have to get some grasshopper tsukudani to give to my staff to try.